As many of you know, the last months have been a whirlwind of travelling for me and just in the last weeks I have been in Russia, Italy, Norway, Japan, Lithuania and now about to leave for Michigan and the annual holiday concert with The Brass Band of Battle Creek. I've just updated the events page on this website for concerts and other events up until early August. I shall be adding other events soon then go to the end of 2012. It promises to be a busy year, with a huge focus obviously due to my involvement, with the ITEC 2012 in Linz. I hope you are planning to be there! This should be a landmark festival for low brass players, right in the centre of Europe. The location simply couldn't be better. There is a huge amount of work going on to make this event is a great success and a full schedule of events during this week will soon be available as the final pieces of the jigsaw are put into place. 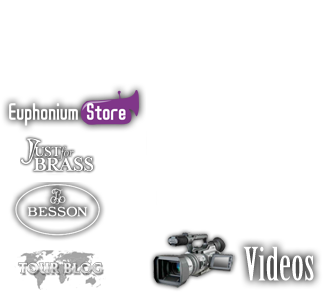 I hope to see many of you on my travels and as we near the end of the year I would like to thank everyone for their continued support and encouragement for my work with euphonium. The e-mails and messages are truly heartwarming and it's always a treat to meet friends from around the world.